If your club is paying, please bring a club cheque to cover all registrants. Show registrants names on cheque. The Rotary Leadership Institute (RLI) is a series of fast-paced, interactive, one-day courses offered to refine a Rotarian's leadership skills and increase their base of knowledge in Rotary. Courses are fun, topical, interactive, and geared toward busy business, professional and community leaders who want to be more effective leaders in their vocation and their Rotary club and become more knowledgeable Rotarians. 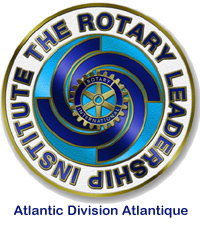 Organization: RLI in Atlantic Canada is coordinated by the Atlantic Division Atlantique​ that represents Rotary District 7810 and District 7820. Rotarian volunteers from each district facilitate the courses. Generally sessions are generally held in 7810 in the spring and 7820 in the fall however additional courses will be organized to meet the needs and demand of Rotary Clubs in either district. RLI Mission: The Rotary Leadership Institute (RLI) is a grassroots, multi-district leadership and Rotary development program using facilitation in small groups to engage Rotarians and strengthen clubs. About the RLI Program: Established in 1992, RLI has become a worldwide organization with divisions in every Continent of the world. While it is an unofficial program of Rotary International, it has substantial support of a number of past Rotary International Presidents and RI Directors. The basic RLI program consists of series of three one day Parts. The material in each part is organized to gradually increase the participants Rotary knowledge and leadership skill and are taken sequentially over a period of time. Brief overviews of the program for each Part may be found on the menu on the left. For more information on RLI, see the website at www.rotaryleadershipinstitute.org. The RLI Recommended Curriculum: RLI recommends a curriculum and provides outlines and faculty materials to all its divisions. The curriculum has been continually revised and upgraded over the years. Because of the growth of RLI, it is expected that major revisions will be recommended every three years in order to give divisions a sufficient opportunity to orient their faculty members and to provide translations where necessary. Important changes in Rotary are provided annually to all divisions. All curriculum materials and available translations are posted on the RLI materials website at www.rlifiles.com. Those that are interested in becoming one of the Group Discussion Leaders and helping to deliver the RLI Curriculum should consider the GDL Course. This course is offered only when numbers warrant and you should let the RLI team know if you are interested in attending the GDL course. Special interest, single topic Graduate Level Programs are occasionally delivered if there is interest and demand. RLI Promotion: Rotary Clubs are encouraged to select at least two candidates for RLI annually. Students return to their club with enthusiasm, new contacts, fresh ideas, an increased understanding of their potential as Rotarians, and valuable skills impacting their potential leadership in the club.